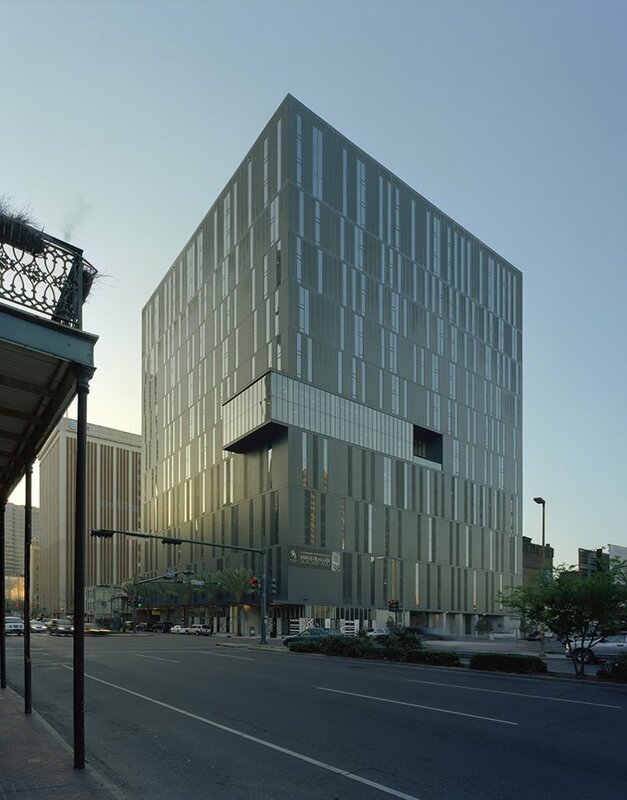 This 21-floor mixed-use residential project at 930 Poydras is designed to reimagine the typically horizontal nature of New Orleans’ dense neighborhood blocks as a vertical condition. The architecture of New Orleans is largely one of communion. Small porches stretch across adjoining “shotgun” houses, promoting neighborhood conversations. Tightly nestled French Quarter apartments spill out into an interior communal courtyard shared by residents. Standing in stark contrast is the modern high-rise, its living conditions private and insular in nature. In this project, we hoisted an essentially local typology into the air in an attempt to enrich the typically introverted environment of high-rise real estate. Sustainable considerations informed design choices throughout the project. 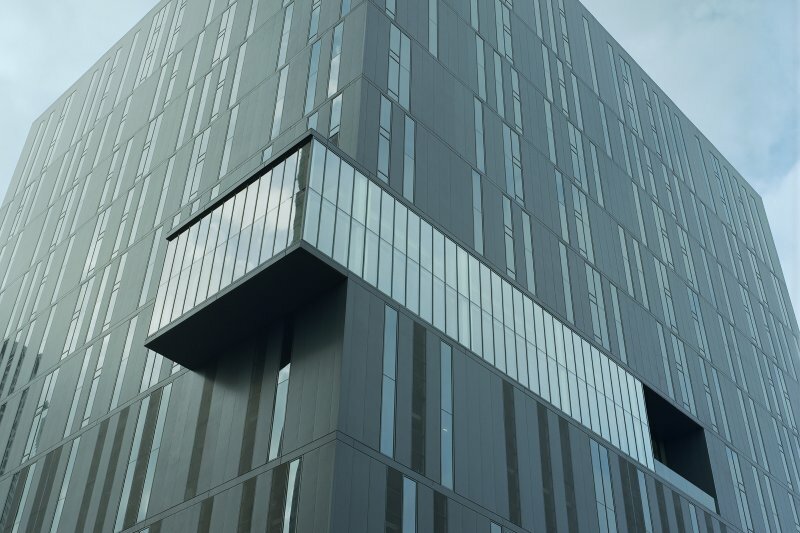 Instead of pursuing the overglazed “glass box” approach of recently completed residential towers in other cities, the project utilizes glazing selectively, while still incorporating a lightfilled common space and providing residents with floor to ceiling views. Vertical joints in the articulated skin shift in half-module increments, providing a cohesive, animated, glass and metal pattern. As a means of recreating the social interaction found in the courtyards of the city’s historic neighborhoods, the design consolidates all tenant amenities at the ninth floor, promoting opportunities for residents to cross paths. 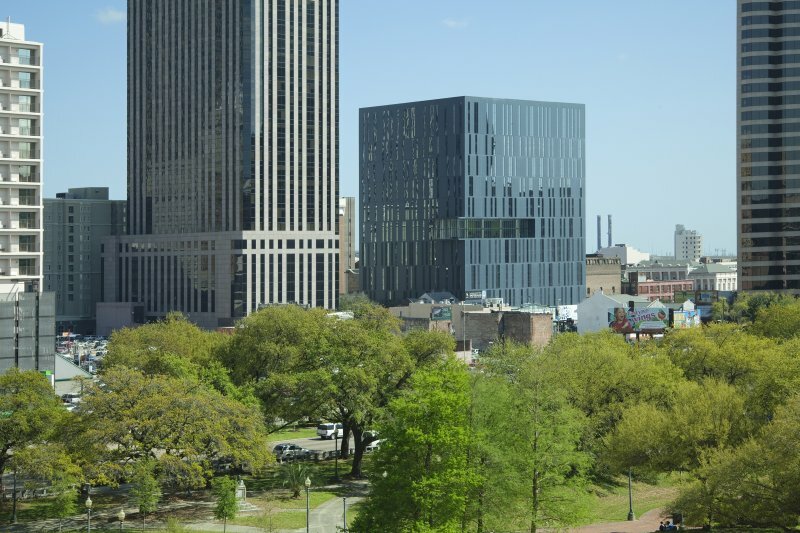 This approach is anchored by a “sky lobby,” a dramatic glass box cantilevering out from the façade and offering spectacular views of the downtown skyline. This gathering space serves as an extension of the tenant’s living room, with coffee bar and movie screening lounge set among warm, informal groupings of furniture. It is at once a retreat and a lively public space. Outside the sky lobby is an expansive deck and pool with a tiered sunning platform, fitness room, an outdoor kitchen, and five two-bedroom townhomes.